Inscribed and dated twice ‘Stylida/26.June.1848’ (lower left and in pencil lower right), also inscribed ‘(84)’ (lower right) with further annotations throughout. Pen and ink and watercolour. 14 x 23.2cm (5 1/2 x 9 1/8in). Sheffield, Graves Art Gallery, Edward Lear, July 1964, no. 84. Lt. Col. Church was the grandson of Charles Marcus Church who was Edward Lear’s companion during his earliest travels in Greece in 1848. The two men remained friends until Lear’s death in 1888. Upon his death, Lear bequeathed Charles Church more than 100 sketches made in Greece while they were together. 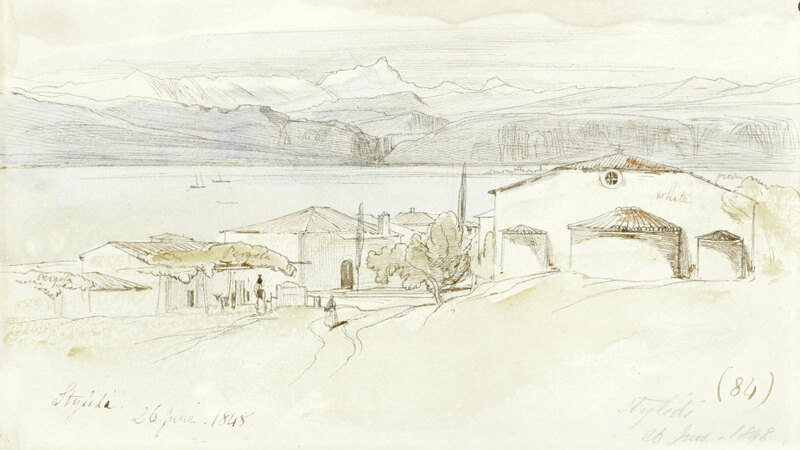 Edward Lear’s diary of the journey in Greece with Church.